The Indian Institute of Alternative Dispute Resolution (IIADR) is organizing a 2 days workshop on ‘Basic Principles of Negotiation and Mediation’ in association with the Young Mediators Initiative, The Hague, The Peacekeeping and Conflict Resolution Team (PACT) and New Law College, Bharati Vidyapeeth Deemed University, Pune on 14th and 15th March 2018 at New Law College, BVDU. 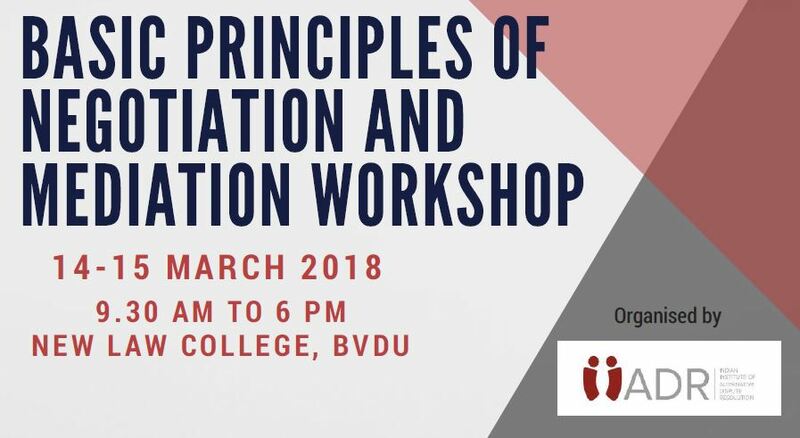 The workshop will focus on basic principles and theories of negotiation and mediation, such as preparing a negotiation strategy, communication skills, dealing with difficult negotiators, designing a negotiation and a mediation process etc. But the workshop will also include practical sessions with exercises and role plays to put into practice newly learned principles. Students will hence be able to take out hands on experience from the workshop. Students will be trained by experienced and skilled mediators: Angela Herberholz, the co-founder of the YMI and former Project Manager at the ICC (France), Jonathan Rodriguez, co-founder of the PACT and accredited mediator, and Shraddha Bhosale, trained mediator and former Deputy Manager at the ICC (France). The event is organised by IIADR, a Pune based ADR training platform that offers a wide range of courses and training programs in negotiation, mediation and arbitration to students and professionals to become skilled ADR practitioners. The event is organized with the participation of New Law College, Bharati Vidyapeeth Deemed University as a venue partner. Contact: [email protected] or Facebook.